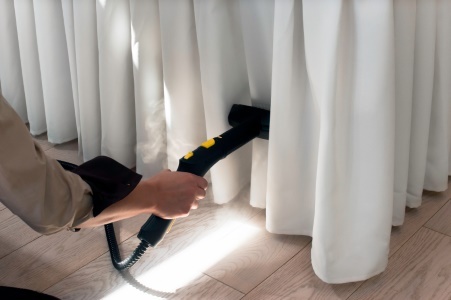 When was the last time you cleaned your Westford curtains? If you can't remember, than it's definitely time. In fact, many home and business owners in Westford, Massachusetts forget about their drapery and upholstery when it comes to cleaning. Certified Green Team has offered professional curtain and upholstery dry cleaning in Middlesex County for more than 10 years. Our knowledgeable staff will provide quality curtain cleaning in Westford for your home or office. Call (617) 586-2586 today for a free quote. Professional curtain cleaning in Westford. Most upholstery and drapery fabric cannot be laundered; it has to be dry cleaned in order to prevent shrinkage and water damage. At Certified Green Team we've got the right tools for the job. Our equipment is made specifically for dry cleaning curtains. Our on site Westford curtain cleaning service means you won't be living in a fishbowl while you wait for your curtains to be cleaned. From stage curtains to living room curtains, our courteous and professional cleaning staff will get your Westford curtains and upholstery dirt and allergen free. All stains are pretreated for optimal cleaning results. Every pleat will be perfect, all hems and edges will be crisp. Guaranteed. Call (617) 586-2586 to schedule Westford, Massachusetts curtain cleaning service.